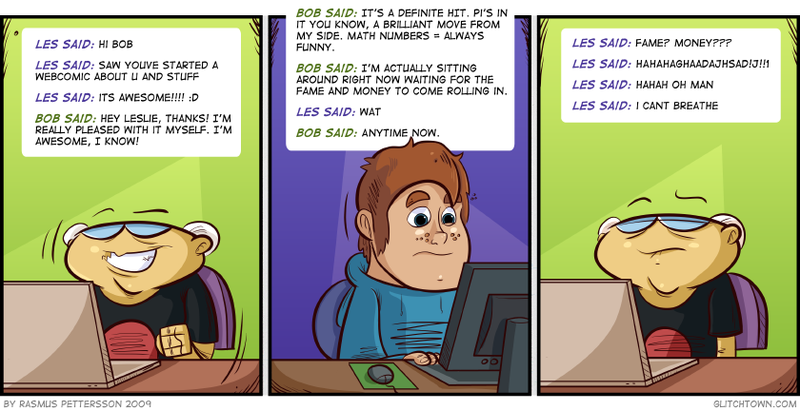 It’s true, Bob has started a webcomic. There’s just not that much money and fame in it though. Now – go read some PC Weenies or UN3, you. This entry was posted on Friday, February 6th, 2009 at 6:00 am and is filed under Comic. You can follow any responses to this entry through the RSS 2.0 feed. Both comments and pings are currently closed. Haha, well good luck with that Rachel. 😉 To be fair, there’s SOME money to make in webcomics… it’s just not enough. That was obvious, but necessary.